A new study from the University of Iowa College of Public Health has found that traffic accidents involving farm vehicles in the Midwest would decrease by more than 50 percent if state policies required more lighting and reflection on those vehicles. 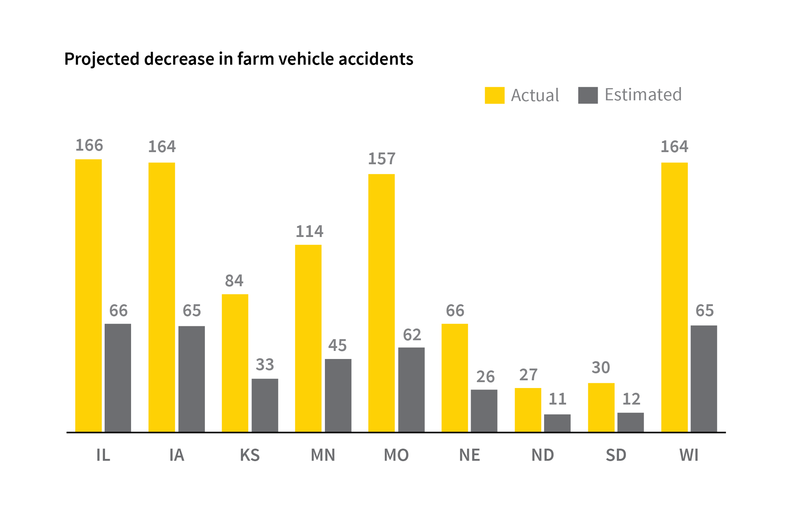 The study by the college’s Great Plains Center for Agricultural Health (GPCAH) compared rates of farm equipment–related crashes in nine Midwestern states in the context of the states’ policies on lighting and marking vehicles. Those states report an average of more than 1,100 farm vehicle-related crashes each year, often causing severe or fatal injuries. The American Society of Agricultural and Biological Engineers (ASABE) has issued standards on lighting and marking farm vehicles to promote safety among all roadway users. The standards suggest certain numbers of headlights, taillights, turn signals, and other exterior lighting visible to other drivers, as well as the number and size of reflective markers. The organization’s standards are not all required by state laws, but many of the nine states in the study have adopted some of them or have their own policies that address the same issues. The researchers found fewer crashes in states with more stringent lighting and marking policies, in particular those that adhered to ASABE’s standards. States with greater compliance with ASABE standards had 11 percent fewer farm equipment road crashes than states with lesser compliance. Illinois law and policies were most compliant with the standards, whereas Missouri’s were the least. Using data from 2005 to 2010, researchers estimate the number of accidents annually would be cut 60 percent, from 972 to 385, if states implemented policies that increased compliance with ASABE standards by 25 percent over current policies. In Iowa, the study estimates crashes would decrease from an annual average of 164 to 65, or by 60 percent. Marizen Ramirez, UI professor of occupational and environmental health and lead investigator on the study, says most farm vehicle–passenger vehicle collisions occur because most passenger vehicle drivers are not familiar with farm vehicles and cannot correctly gauge the speed at which they are moving. This often leads to vehicles approaching too quickly and attempting to pass in unsafe conditions, which can result in a crash. She says the likelihood of a crash is greater in October and November, when more farm vehicles are on the road for the harvest and the sun sets earlier. The study is published in the current issue of the Journal of Occupational and Environmental Medicine.